"The South has always been shoved around like a country cousin. It buys mill-ends and it wears hand-me-downs. It sits at second-table and is fed short-rations. It is the place where the ordinary will do, where the makeshift is good enough. It is that dogtown on the other side of the railroad tracks that smells so badly every time the wind changes. It is the Southern Extremity of America, the Empire of the Sun, the Cotton States; it is the Deep South, Down South; it is The South. In the Depression, however, the South was anything but ignored. In fact, the country cousin became the poster child. 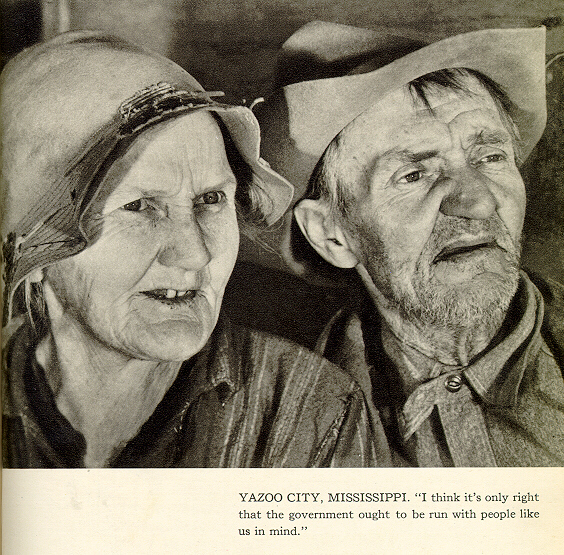 In You Have Seen Their Faces, in Let Us Now Praise Famous Men by James Agee and Walker Evans, on the pages of Life, and in the annals of the Farm Security Administration, Americans saw Southerners -- Southerners who were Americans. For You Have Seen Their Faces, Margaret Bourke-White -- a New York Yankee -- took the pictures, Erskine Caldwell -- a native Georgian -- wrote the body of the text, and they both wrote the captions. What did they say about the people of the Depression South? What did they find to define Americans?